Preheat oven to 425 degrees. Place a pizza stone in center of oven to heat while preparing toppings for pizza (for at least 30 minutes). Melt butter along with garlic powder and onion powder in a medium saucepan over medium heat. Whisk in flour and cook for 1 minute, stirring constantly. While whisking vigorously, slowly pour in cream and milk. Bring mixture just to a gentle bubble stirring constantly. Allow mixture to gently boil for 20 seconds, stirring constantly. Remove from heat, add in Parmesan cheese, season with salt and pepper to taste then return to warm heat and stir occasionally until ready to use. To assemble pizza: On a floured work surface, flatten, stretch and shape pizza dough into a 13 to 14-inch round, while creating a thicker outer crust. Sprinkle a wooden pizza peel with flour and cornmeal and transfer shaped dough to pizza peel, reshaping dough as need. Remove pizza stone from oven, sprinkle lightly with cornmeal then carefully slide shaped pizza dough from pizza peel onto hot pizza stone. Pour half of the Alfredo sauce over dough round, then use the back of a spoon to spread into an even layer coming within about 1-inch of the edge. Sprinkle shredded chicken over sauce layer, then pour remaining sauce evenly over chicken. 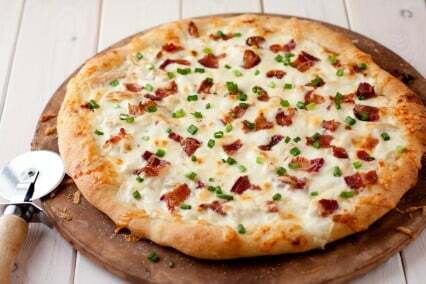 Sprinkle top evenly with Mozzarella cheese then sprinkle with chopped bacon. Brush outer crust with olive oil and season crust lightly with a pinch of garlic powder and salt. Bake in preheated oven 14 - 16 minutes until crust is nicely golden. Remove from oven, garnish top evenly with green onions, cut into slices and serve warm.